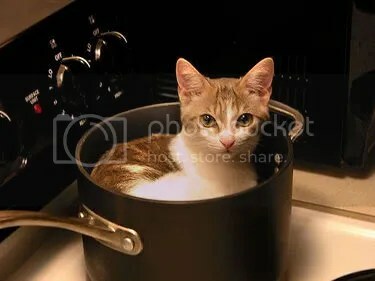 According to an Italian cooking show host, cat stew is a delicacy. Beppe Bigazzi recently declared that: “Cat, soaked for three days in the running water of a stream” in Tuscany “comes out with its meat white, and I assure you — I have eaten it many times — that it is a delicacy.” He also noted that consuming cat is no more or less bizarre than eating pigeon, rabbit or chicken. Why indeed. Bigazzi’s behavior seems wonderfully subversive. He had to know what he was doing and he did it anyway. I’d love to know what motivated him.